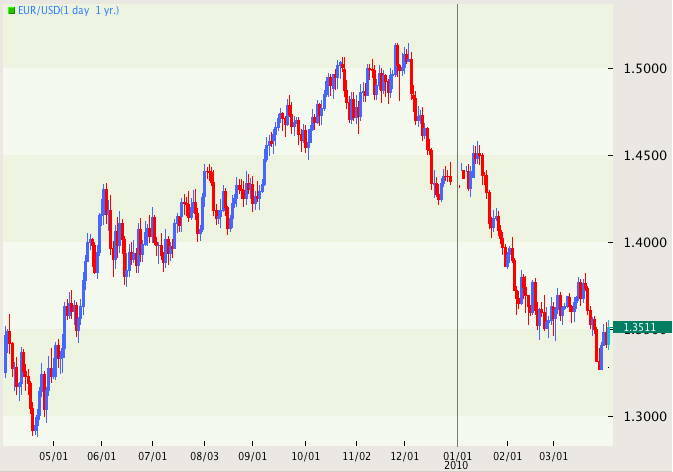 The recent 2% snap back from 2010 lows at $1.3270 to $1.3445 may be the end of Euro strength indicated by new record unemployment of 10% in February. It was 8.3% in February 2009. The Euro digested this kick in the stomach and even survived another one in the groin, this time ratcheting inflation being the cause without pain so far. Eurostat's flash estimate for inflation shot up to 1.5% in March from 0.9% a month earlier. As if that were not enough, Germany reported an unprecedented 2009 record budget deficit of €105.5 billion on 6.7% higher expenses of €1.12 billion. In 2008 the deficit was a mere €5.2 billion. It appears highly unlikely that Germany will manage to stay within the planned €80 billion deficit in 2010. None of the problems - rising social expenses, slashed tax receipts - has been solved neither in Germany nor the rest of the Eurozone. GRAPH: The Euro is on the way to a new 1-year low against the US dollar for very fundamental reasons that have yet to be tackled on the old continent. Is China getting ready to tighten credit? In a most pragmatic move 3 rather hawkish economists have been added to the monetary policy committee of the People's Bank of China (PBOC), according to a report on chinadaily on Wednesday. The 3 academics replace leaving scholar Fan Gang, indicating that China may begin to tighten runaway credit rather sooner than later in a least painful way. Xia Bin, Li Daokui and Zhou Qiren are all on the record earlier this year, favoring a timely withdrawal of stimulus. Greek tragedy, next part: Germany has reversed its position and said it is comfortable if Greece turns to the International Monetary Fund (IMF) for assistance to avoid the country's bankruptcy. The 180-degree turn is understandable as direct German loans could set a precedent for the PIIGS who will need help going into the Trillions of Euros. Germany cannot save the whole Eurozone and Chancellor Angela Merkel is in the mid of parliamentary discussion about Germany's record budget deficit of €80 billion. Will the Pan-European Idea Get Buried Under Debts? Watching the rapid deterioration of unity in the Eurozone, this blogger begins to wonder whether the hardest crisis since WW2 will deepen the rifts in a culturally diversified region where the biggest common denominator has become debt. Only a few months after the ratification of the Lisbon Treaty - despite initial no-votes in France, the Netherlands and Ireland where the voters will was overridden by governments - the helplessness of EU bodies to tackle the economic plunge resulting from irresponsible monetary policy by the ECB during the last decade, the unwillingness of EU citizens cannot be overlooked anymore. Protests and strikes have erupted. A strike of French refinery workers uncovered the thin pillow of European prosperity: 10 days and France would have been out of fuel. Greek protest have been going on for months, first about police brutality and now escalating as the sovereign discovers the enormous size of the disaster. Greece is bankrupt and needs a lifeline. Meanwhile the country is crippled by one general strike after the other. In Germany Lufthansa airline pilots bang the drum for another strike, while the UK, bankrupt as Greece, only in a much bigger dimension, tries to avert a strike of cabin staff at British Airways. Europe is also not short in internal separatist movements. In a new twist in the ongoing Greek debt tragedy Germany's chancellor Angela Merkel has stepped up the war of words, saying the Eurozone must be able to expel members that repeatedly break the club's fiscal rules in the future in a speech to the Deutscher Bundestag (parliament) on Wednesday. Merkel is beleaguered at home, trying to push through a record budget deficit of €80 billion that threatens the current conservative-liberal coalition. Merkel's hardball was picked up in Greece by Prime Minister George Papandreou, who reminded other Eurozone members that they had not yet come up with a viable alternative. A botched currency reform that led to a 50% devaluation of the North Korean Won and ignited inflation cost the top official responsible for it his head. The execution by firing squad in Pyongyang last week of Pak Nam-ki, Labour Party chief for planned economy, was for the crime of "a son of a bourgeois conspiring to infiltrate the ranks of revolutionaries to destroy the national economy", South Korea's Yonhap news agency said, quoting sources. Pak had been purged in January and was executed for "deliberately ruining the national economy" as a "son of a big landowner", South Korean media say. 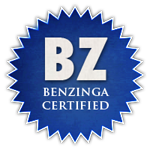 This blog's first post was concerned about the sustainability of the US AAA rating back in April 2005. 5 years later, Moody's follows suit. Under the ratings company’s baseline scenario the U.S. will spend more on debt service as a percentage of revenue this year than any other top-rated country except the U.K., and will be the biggest spender from 2011 to 2013, Moody’s said today in a report. Central Bank's (ECB) Monthly Bulletin for March the ECB's economic staff predicts it will take 16 years until Eurozone government debt levels return to the Lisbon Treaty level of 60 %. "Fiscal developments as of 2011 are determined by three alternative scenarios shown in Chart A. 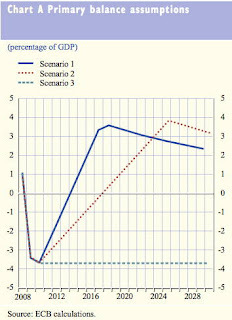 Scenario 1 assumes a rather rapid fiscal consolidation process, with the primary balance improving by 1.0 percentage point of GDP per year until an overall balanced budget is reached (in 2018). Thereafter, the primary surplus is assumed to decline slightly in order to maintain the budget in balance until the end of the simulation period (i.e. 2030). 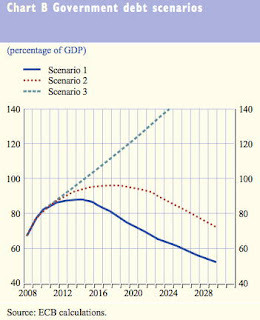 Scenario 2 assumes a less ambitious consolidation path, with the primary balance improving by only 0.5 percentage point of GDP per year until an overall balanced budget is reached (in 2025). Primary surpluses compatible with a balanced budget are then assumed until 2030. Finally, Scenario 3 assumes that no consolidation efforts are made. The primary balance remains at -3.7% of GDP, i.e. constant at the forecast value for 2010, over the whole simulation period." The developments of debts under these 3 scenarios reach from bad to horrific as chart B reveals. If nothing is done, debt:GDP ratios may climb to an unmanageable 150%. GRAPH: Once the ECB gets so pessimistic/realistic in its ultra long term outlook it is time to get prepared for the toughest of all times since WW2. Word has probably spread that the European Union now attempts to solve the debt crisis with the creation of a European Monetary Fund (EMF). This shows one more time the fierce commitment of the EU to fight debt with new debt - which never worked in history - instead of developing a radical banking reform that would curb derivatives and impose strict rules on off-balance sheet risks while tackling soaring budget deficits aggressively. As with most "important" announcements these days - of which most are vaporizing overnight in a EU where governments begin to mutually shoot broadsides against their Pan-European fellows - the EMF "plan", initiated by German Finance Minister Wolfgang Schaeuble, is maybe a headline-grabber, but lacks among all details the most important one: Where will the money come from??? We will have to wait for the annual report on April 19 to check the balance of higher expenses to see how much inflation the European Central Bank (ECB) experiences itself. According to first results published on Thursday, the ECB's expenses rose a stunning 4.4% in 2009, while inflation receded below 1% in the Eurozone. Representative of the worldwide crisis the second biggest central bank in the world reports a 15% cut in it's 2009 profit. The ECB earned a surplus of €2,218 million in 2009, compared with a surplus of €2,661 million in 2008. Following a technical adjustment to its risk provision, the ECB’s declared net profit for 2009 amounted to €2,253 million. While clueless politicians and bankers have still not come up with decisions that could turn around the economy, Mr. Market may soon force them into action. Greece may dominate headlines these days, but this buys other equally distressed Eurozone economies time to fly under the radar. Market talks center around the PIIGS (Portugal, Ireland, Italy, Greece, Spain) these days. While they fill headlines there is one Eurozone country that may be a stealth ticking bomb: Austria. 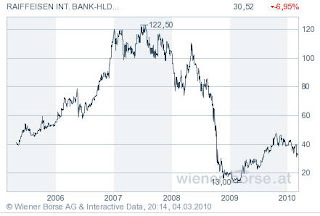 First ripples in 2009, when banking giant #2 Raiffeisen withdrew a capital note exchange offer for lack of investor interest, now turn out to have been a sensitive telltale of the grave problems engulfing the country. Europe has reached the modern day version of the 7 plagues. Hurricanes, snowstorms and floods are ravaging France, Germany Portugal (Madeira) and the UK, creating new billion bills to rebuild the damaged infrastructure. Strikes and protests shake the streets of Greece, Spain, Italy, Germany, Belgium. Fiscal deficits balloon to historically unprecedented levels. Demographics worsen with every day and Europe will collapse under 100 million pensioners in this decade. There are NO signs for economic improvement anytime soon. We haven't seen anything of the banking crisis yet in continental Europe and yields WILL rise due to higher risks. Except for the natural disasters and demographics central and commercial banks are responsible for all other crises listed above. I have lost count how often I heard the promise of an upcoming solution to the financial crisis that now mutates into a prolonged economic slump. Browsing this blog's archive for official statements I am unable to find one single admission of guilt - or at least error - by a member of the banking industry or supervisory authorities. Since August 2007 banksters have been busy telling the rest of the world that consumers should not worry as the crisis would be contained. Since August 2007 they have been wrong. While the rest of the US labour market is still in free fall, job openings at the world's biggest money printer become abundant. 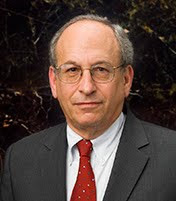 The resignation of old hand Federal Reserve Vice Chairman Donald Kohn raises the number of open slots at the monetary policy setting Federal Reserve Board to a stunning 3 out of 12 available fireside chairs. In a letter to the Fed Kohn announced his intention to leave the Fed after a 40-year career by June 23. Alas, his cautioning was totally ignored until the (not so) unexpected housing bubble began to burst and has crashed America into the biggest debt crisis of all times. Kohn's resignation is another blow to the beleaguered Fed whose chairman Ben Bernanke refuses to accept the concept of bubbles through too easy credit, worsening the situation with the Fed's ZIRP with every passing day. As Kohn's resignation leads to a 75%-Fed where only 9 persons decide the fate of Federal Reserve Notes and the Fed's wilingness to monetize the debt, US President Barack Obama confronts another pothole on the road of his presidency as there are seemingly no takers for 3 of the most interesting - but nowadays also most challenging - jobs in the world. Isn't it astounding that a quarter of the FRB is vacant and no experts want to tackle the job? We may witness a selection of the negative: I have been highly inconfident into "helicopter" Bernanke since his nomination because of his infamous speech from 2002 where he hallucinated about "money at virtually no cost." 3 vacancies, 2 of them open since years, at the most powerful board in the world of fiat money lead to one conclusion: If nobody with the required expertise wants to do the job it is most certainly because they see what the blogosphere sees since many years. The US path of ballooning deficits is unsustainable and unbacked Federal Reserve Notes (FRN) will go down the drain as ALL fiat currencies did in the last 300 years. Current woes in the Eurozone (Greece is not California) may delay the end of the dollar a little, but Kohn's prediction may have even reached to the point where the unexpected demise of the world's biggest Ponzi scheme - called US dollar - will inevitably happen. Kohn does not appear to hope for a wonder, taking it from his letter, says the LA Times. In a letter to President Obama announcing his intention to resign from the board, Kohn didn't say why he planned to retire at this juncture, but noted that the last several years have tested the ability and dedication of the Fed to maintain financial and economic stability. "I am confident that history will judge the Federal Reserve, under the leadership of Chairman Ben Bernanke, to have met these challenges with great speed, imagination and effectiveness," he said in the letter dated March 1.